You know Mamarazzi lazy to cook right? Sometimes we went rounding to Subang Jaya. 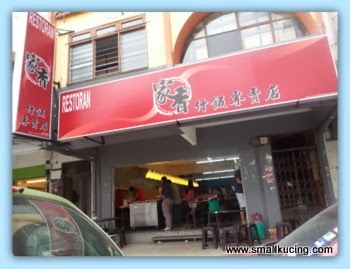 Then before go home, Mamarazzi will drop by this restaurant to "tapau" mixed rice. She love that they have a large variety of dishes to choose from . It's like a buffet of dishes leh.
. Mamarazzi would scoop scoop to find chicken feet coz Papa likes to eat Chicken feet. 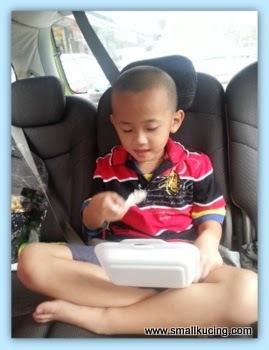 Beh tahan....ate in the car. Nice to eat while the rice is still warm. Now who can guess which one is mine, Papa and Mamarazzi's . Total...RM13.50 only. Not bad leh. If buy vegetable and cook will cost more than this leh. Location of this restaurant...errr....do not have the exact address but it's at Jalan SS15/4B. It's right near the junction of Jalan SS15/$a meets Jalan SS15/4B, Suabang Jaya. I know this street has several mixed rice shops that salivate me! 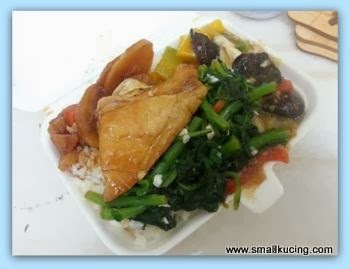 I prefer Feng Seng Mei Wei shop for their good variety! Kaldip loves kaki ayam! What is so nice? I am curious. I don't know how he can eat chicken feet... but then I never tried them. have to take away the outer layer of skin . 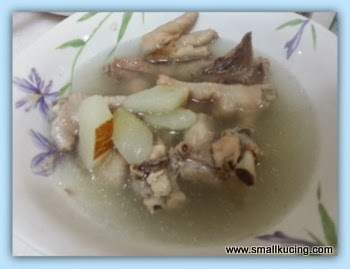 The outer layer of skin cannot be eaten,. Taste good if you make it into salad. There can't be much to eat on a chicken foot? Just the thougts of it stilll make me go blah!! 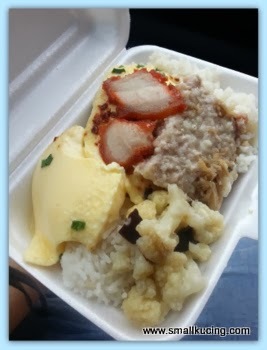 Anything with steamed egg or steamed minced oink oink always ngam for kids, yes? Easy to telan with rice ma.. Wah, if me also I will eat in the car also.. Lastime when I was a kid in primary school, mum (working full time) always tapao-ed mixed rice for me before fetching me to school (somehow she can find time-off to fetch us).. Then, I will eat in the car before getting off.. Same for morning school, mum will tapao mixed rice and put in the car, when I got up, I will eat in the car, then balik rumah terus mandi & tidur..
CHAP FAN!!! though Uncle SK try to cut down rice, but then when it comes to chap fan, and especially when he sees that many different types of dishes laying on the table in front of him, he can get very excited.. so how many dishes do they have in Jia Shiang?? Uncle SK have been to places where they have more than 70 dishes for you to choose, crazy and exciting kan?? yeah, free soup!! i think this surely makes the customer happy right?? Uncle SK mean the soup may not cost them a lot lah (or can charge the soup into the rice) but it's a good move to have better service to the patrons mah.. Uncle SK think many chap fan stalls or even chicken rice stalls are doing this.. if got free soup, he will go and get one bowl lah, but of course i just have the soup and not scoop the ingredients - he doesn't eat them, he likes his soup just soup, haha!! Must take you to the one here. I'm sure they've over 50. Personally, I think only a few will do - as long as they all taste really good. 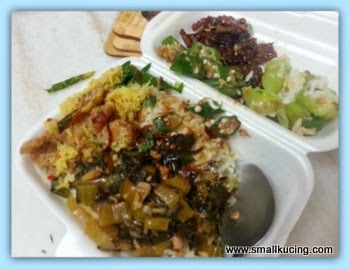 Yours is the first one, your mum's the 2nd one - lots of green veg...last one, so much, sampai tak muat - must be your papa's! Muahahahahaha!!!!! yea 1 or 2 person very lazy to cook . 1) Papa 2) Joshua 3) Mama Betul ke? I can't even see the rice ! Wah, Mamarazzi so hardworking lately, blog everyday! Luckily I am having my lunchtime now otherwise will make me hungry. 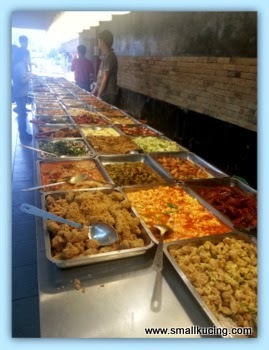 I think (1) must be yours, (2) for Mamarazzi and (3) for Papa because it has a lot of food! Too bad this shop is so far away from my place or else I will surely go "pong chan" them. My guess 1) Small Kucing because of the steamed egg 2) Mamarazzi because of the vege 3) Paparazzi because got a lot of food. #1 is Joshua; #2 is mama, #3 is papa?